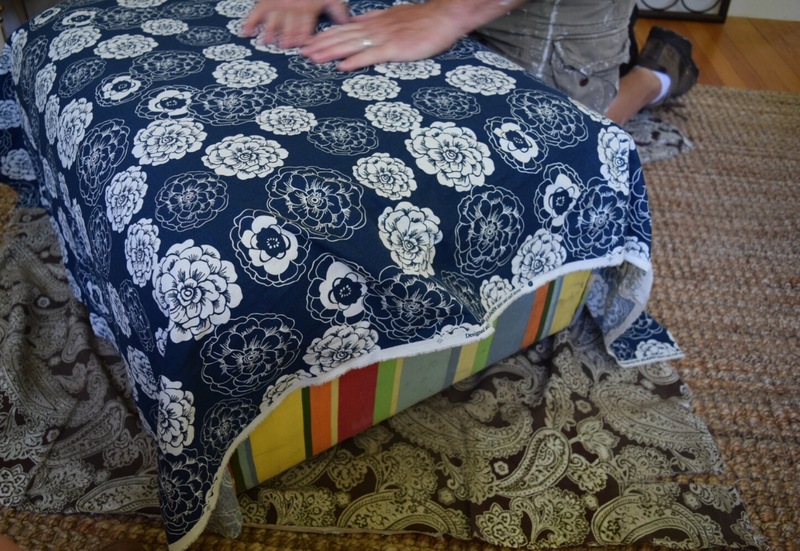 I am making an old, very much loved ottoman new again! This ottoman is nothing beautiful at all, it was just in our family room while I was growing up. About 15 years ago, my parents were cleaning out the basement and there it was in all it’s 90’s glory. It was jade green and white strips! If you got married in the early 90’s then you know Jade green was the “it” color! But when I found it it was the early 2000’s so of course I covered it in loud bold stripes! Then in about 2006, it was covered in this beautiful fabric, brown & green. Pairing brown with green or pink was all the rage 10 years ago. Then we moved again, and it found it’s home in the barn where the kids set up a tv room! When we moved to our current house, we quickly discovered that our oversized furniture would not fit in our small family room, so we downsized the furniture. I needed an ottoman that could double as a coffee table when we needed it. This is also the room that the dog hangs out in and for some reason even though he is 80 pounds and hangs off of it, his place to rest is on the ottoman! so it is a little dirty and for the Summer I wanted to add some navy and white to this room! 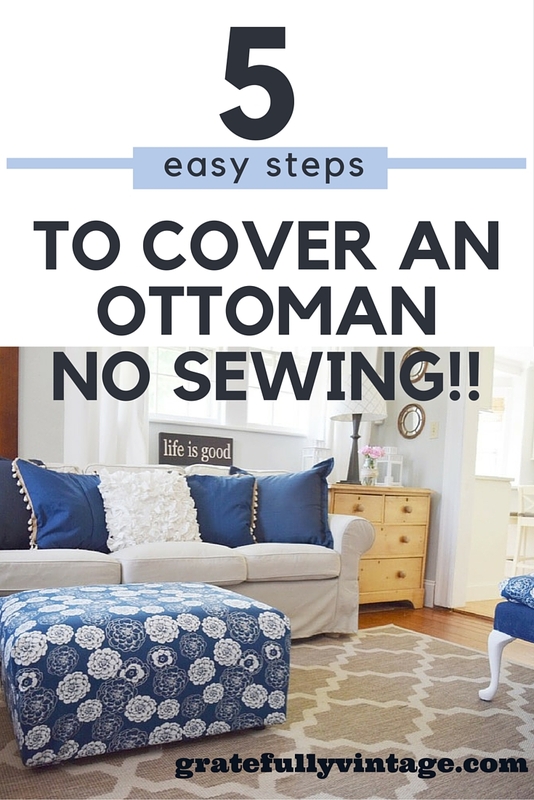 So I want to show you how to cover an ottoman with out a sewing machine! 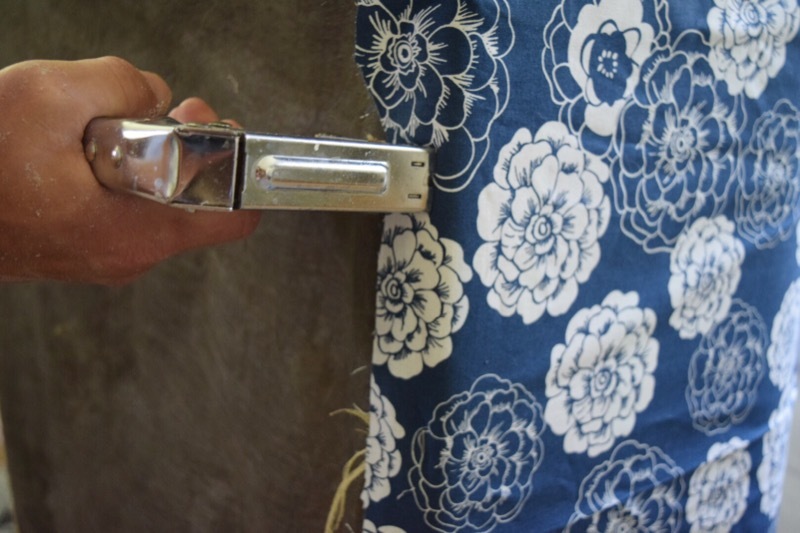 a friend to help you pull the fabric so it is super tight! What I did first is I took off the brown fabric and used it as my pattern! 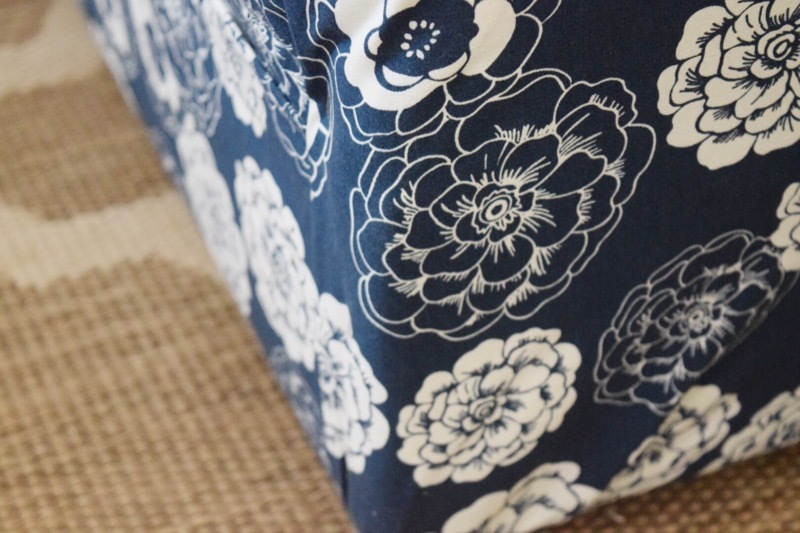 When I originally found covered it, I measured the ottoman length wise and added 4 inches! I also needed two side pieces. My husband was home so I used him as my model and he was super helpful! After the jade green and white stripes and before the brown and green it was bright stripes! Step 2: Pull tightly and add about 4 staples to the bottom of the ottoman, while the other person helps hold. Do this on both sides. Step 5: Now grab the sides of the envelope fold and staple them. Repeat on the other side. I am loving the navy and white! It is so crisp and nautical. See that chair, peeking out in this photograph? I painted the fabric, if you want to check it out you can see that post here! I would love for you to follow me on Instagram and on Pinterest! If you want to save this post, below is a pin just for you! Just hover over it and press, it will bring you to your Pinterest! I thought I was going to have to slave over my sewing machine to do a slip cover for our ottoman, but I am giving this a try instead. Thanks! You are right about Navy! I went shopping for a Mother of the Groom dress this fall and found that Navy was the staple color. Since it was the bride’s maid’s color I could not use it but the shoppes informed me that it is now considered a neutral so all of the dresses came in Navy! I love that you keep updating something you love to make it work for our ever changing design world. thank you so much, Debbie! & congratulations on being a mother of the groom! 😉 How exciting that your son got married! And smart DIL for choosing Navy! What a difference that made! I love the new color and the fact that you did it in just a few steps! thank you so much, Kristy! 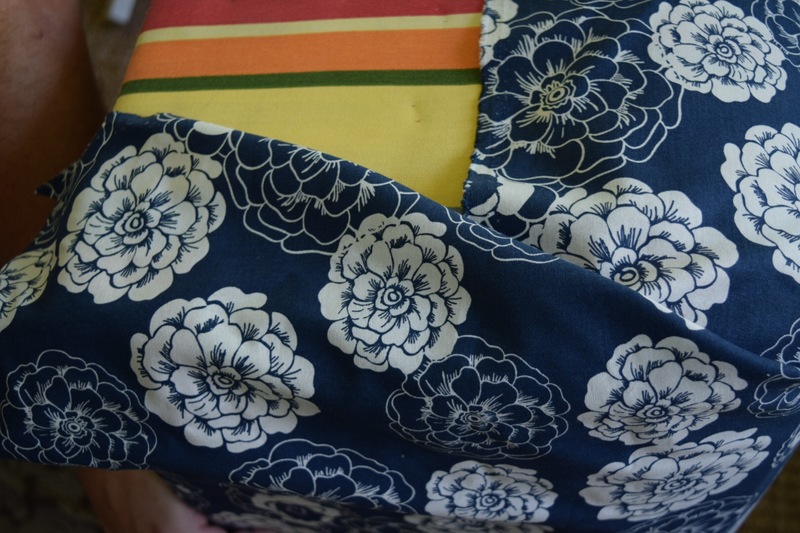 It is amazing what a difference the new fabric made! 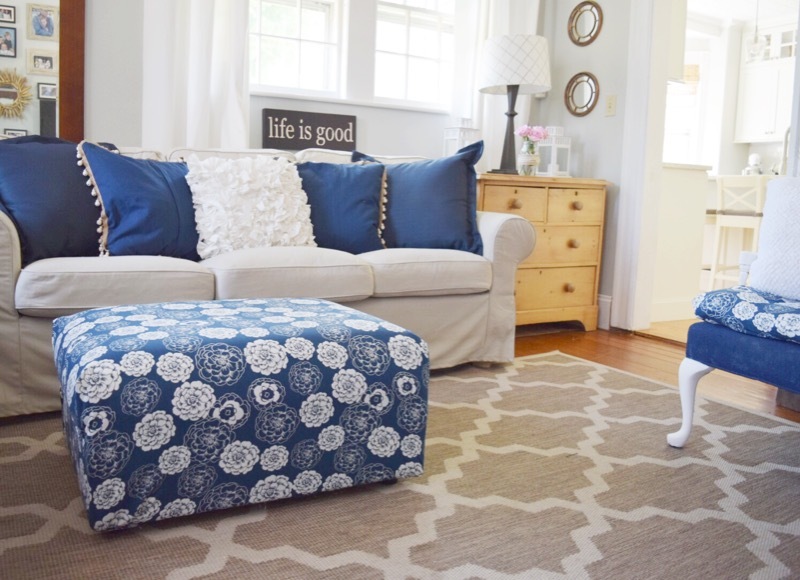 I love navy & white for the summer and can’t wait to redecorate again 😉 though it’ll be a bit til then… your ottoman looks so lovely and I love how easily you changed it’s style! 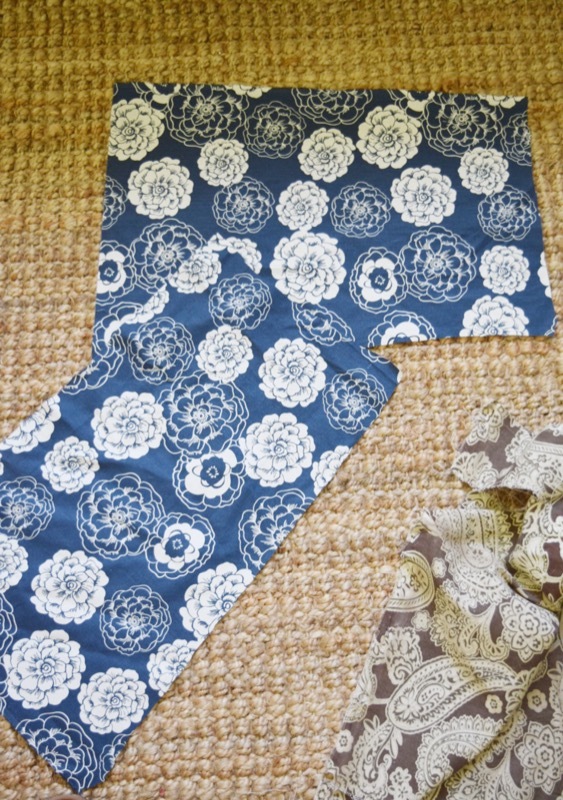 I love that fabric and seeing the old fabric peek out from underneath it really got a major transformation. 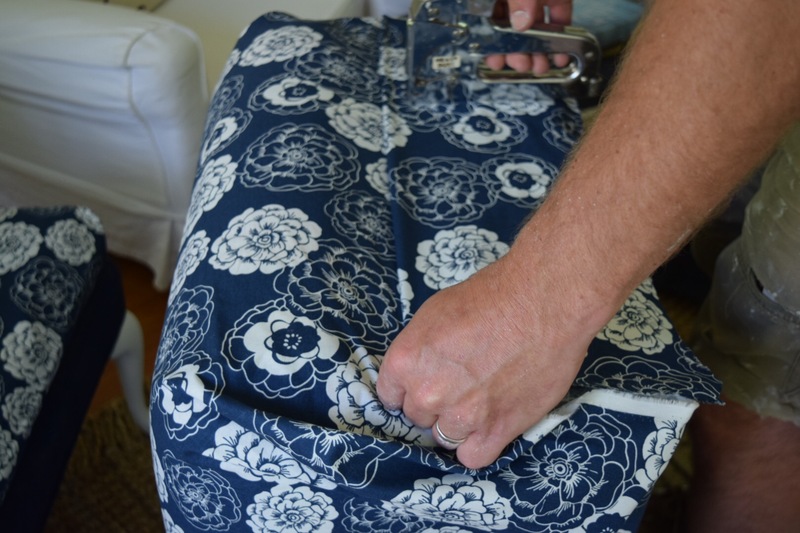 I love no sew projects for easy updates with huge impact. LOVE that fabric you chose! Thank you for sharing this with us at last week’s To Grandma’s House we go link party, you will be featured at the new party tomorrow morning! Hope to see you there! What an honor! Thank you so much! so with the side pieces you basically created a sort of pocket on each side? you are so welcome & thank you Marjan! That looks wonderful!! Now, I only wish I had an ottoman I could cover!! Do you ever cover it for Christmas?? Love the history of this piece that so many people would have tossed to the curb. You not only have a beautiful and functional piece for your home but you and your family get to talk about the transformation along the way and what might be the next coming trend it will change to! That fabric looks so fresh and summery!! Looks great! Thank you, Susanne & thank you for stopping by! Awesome Kellie, love what you did here. 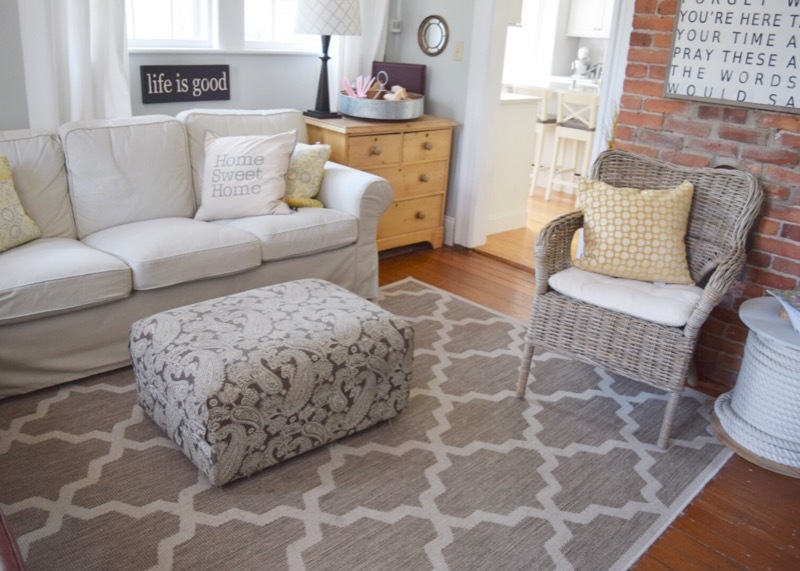 The ottoman looks great and I love how it freshens up your living room. Sweet with the new painted chair! This is an amazing no sew makeover. 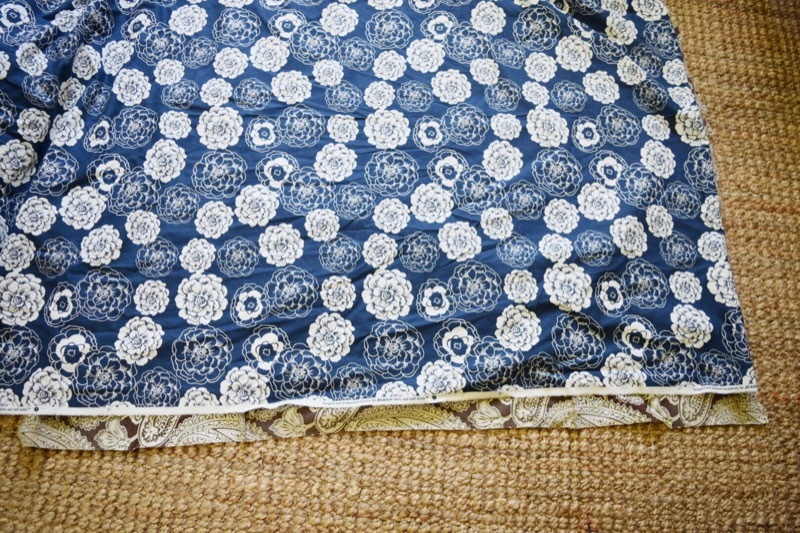 It looks as if it has always worn this crisp fabric.? Thank you, Lisa! & so easy!